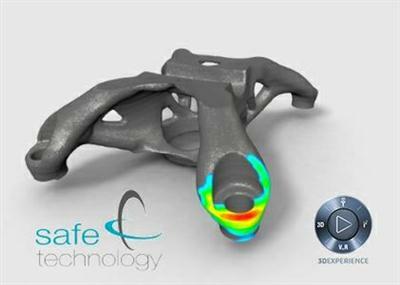 Dassault Systemes, the 3DEXPERIENCE Company, world leader in 3D design software, 3D Digital Mock Up and Product Lifecycle Management (PLM) solutions, announced the general availability of Release 2016x of the 3DEXPERIENCE FE-SAFE platform, is the durability Analysis Software for Finite Element Models. fe-safe is the technical leader in fatigue analysis software for Finite Element models and is capable of meeting its users' most demanding applications. It directly interfaces to all leading FEA suites and is used by leading companies in the transport and mobility, aerospace and defense, general manufacturing, power generation, marine and offshore industries worldwide to determine fatigue life and optimize designs. fe-safe is renowned for its accuracy, speed and ease of use. fe-safe has been developed continuously since the early 1990's in collaboration with industry to ensure that it continues to set the benchmark for fatigue analysis software. It was the first commercially available software to focus on modern multiaxial strain based fatigue methods and the first to incorporate capabilities for non-metallic materials. fe-safe analyses metals, elastomers, thermo-mechanical and creep fatigue and employs the Verity structural stress method or the fatigue analysis of welded joints - the only commercial software to incorporate this methodology.